SUBJECT :What actually is agritourism, and what are the benefits of it. Introduction to Agritourism: Agritourism or agrotourism, as it is defined most broadly, involves any agriculturally based operation or activity that brings visitors to a farm or ranch. Agritourism has different definitions in different parts of the world, and sometimes refers specifically to farm stays, as in Italy. Elsewhere, agritourism includes a wide variety of activities, including buying produce direct from a farm stand, navigating a corn maze, slopping hogs, picking fruit, feeding animals, or staying at a bed and breakfast (B&B) on a farm. Agritourism is a form of niche tourism that is considered a growth industry in many parts of the world, including Australia, Canada, the United States, and the Philippines. Other terms associated with agritourism are "agritainment", "value added products", "farm direct marketing" and "sustainable agriculture". People have become more interested in how their food is produced. They want to meet farmers and processors and talk with them about what goes into food production. For many people who visit farms, especially children, the visit marks the first time they see the source of their food, be it a dairy cow, an ear of corn growing in a field, or an apple they can pick right off a tree. Farmers and ranchers use this interest to develop traffic at their farm or ranch, and interest in the quality of their products, as well as awareness of their products. Since 2004 Agriculture Tourism is operational, it started in Baramati Agri Tourism Center under the guidance of Pandurang Taware. He received the National Tourism Award from the President of India, for the most innovative Tourism Product. Agri Tourism India (ATDC) is pioneer in the development and marketing of agri tourism concept in India. ATDC, as of 2014, has 218 affiliated farmers and operates agri tourism center in their respective villages in the state of Maharashtra. 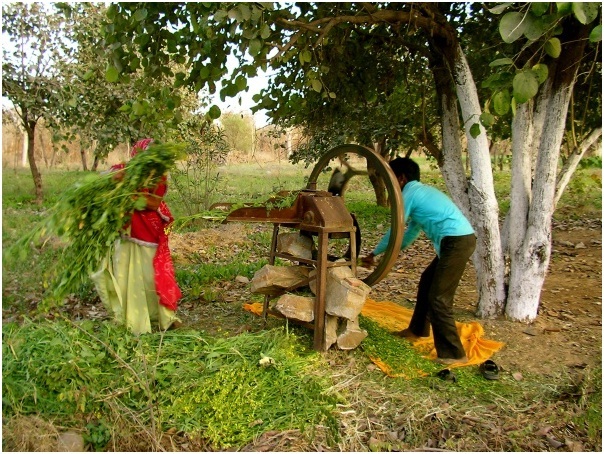 Agritourism is the latest concept in the Indian tourism industry, which normally occurs on farms. It gives you the opportunity to experience the real enchanting and authentic contact with the rural life, taste the local genuine food and get familiar with the various farming tasks during the visit. It provides you the welcome escape from the daily hectic life in the peaceful rural environment. It gives you the chance to relax and revitalize in the in the pure natural environment, surrounded by magnificent setting. See the real India and have the experience of the lifetime on the farm stay holidays. Farm Stay: Well you must now be bored of visiting the hill stations and staying in the first class Ac hotel room. And you might be looking for the change this time. And to offer you the holidays with the difference agritourism is definitely a good option. To get that very special experience of the rural ambiance and to enjoy the rural life, Indian tourism provides you the opportunity to stay right away in the farms houses along with the other villagers and experience the difference. Witness the unique lifestyle of the villagers. Learn about the their age old traditions and culture, which they resume till date. Converse with them and feel how warm hearted and simple they are. Along with them spend time playing the pleasing rural games such as taash (cards) and kho kho. Then there are interesting bull fight and wrestling matches held on various occasions in the village. On the tour to the village what attracts you the most is the colorful costumes of the villages. Womens are seen wearing the ghagra choli (Skirt and top) or the saris. While are men are donned up in the traditional kurtas and turbans. Both men and women are usually seen wearing the various jewelery items. 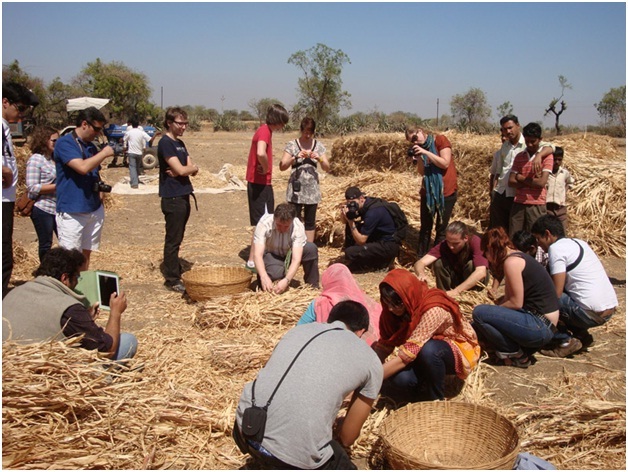 Venturing into the agricultural farms: Roam into the vast spreaded acres of agricultural lands along with the group of villagers who can provide you the better insight of the village. As you roam into the fields, feel the smell of the India soil, which gives you the real flavor of India. Enchant with the farmers working hard in the fields. Take the view of the bulls ploughing the fields. The wells, other water bodies, mountains and forests are the added attraction for the tourists. Animal Rides: Apart from all this, holidays on farms provides you the complete entertainment. Ride on the bullock carts along with the villager's into the agricultural fields. See them carrying fodder for animals into the buggies. You can even take the camel ride to explore the village and the surrounding areas. Cow Milking: Cow milking is real exciting activity, which can't be escaped. Practice the art of cow milking from the villagers. Feed the cows with the fodder and chapatis. See how the rural womens cook food on the chulas made of mud. Taste the authentic rural cuisine and drink fresh milk of cow. Rural art and craft: Villages are expert in making the handicrafts, it is something which is passed on from their one generation to the other. You can carry some of the items back to the home as the momentum. Village fairs and festivals: You can also participate in the village seasonal harvest fair and festivals. Onam, Baishaki and Pongal are some of the village most famous harvest festivals. Than you can enjoy the traditional dance and music performed by the villagers on such occasions. You are advised to respect the local tradition and please do not take out the photographs without permission as the villagers are quite conserve and orthodox. Information is extracted from the Wikipedi.org and Ecoindia.in website.